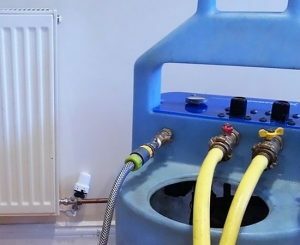 Emergency Plumbers Hampshire are the leading specialists providing radiator, central heating and boiler system powerflushing services for customers in Hampshire, removing sludge and rust that can build up over years inside the boiler, radiators and piping. The central heating slowly clogs up and you end up paying high bills and with a central heating system that is not working efficiently. Powerflushing is a quick and efficient technical solution to resolve sludge and rust problems in radiators and usually will result in increased heat output from your radiators – for a no-obligation quote call us at the number above. We operate to industry standards and practices leaving you with a cleansed radiator system. Modern boilers can have heat exchangers that are extremely slim in design compared to years ago and even small bits of sludge or rust can cause partial blockages in the boiler heat exchanger. If you are fitting a new boiler in Hampshire, it is advisable to have the radiators power flushed as the boiler guarantee may require cleaning before a new boiler is fitted. We are the experts in powerflushing radiators and central heating systems in Hampshire.